It was a quiet Sunday evening and I was spending my last day in London (and last weekend in the UK) running around with a lovely London friend during very touristy things, because we're silly like that. 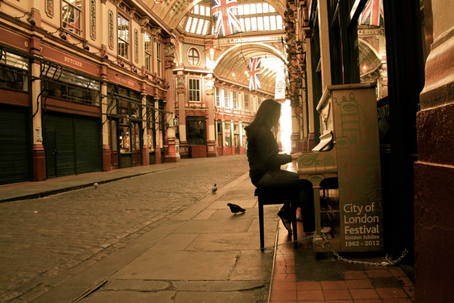 Leadenhall market produced some spectacular memorial photographs, and I get to check "play a piano in the middle of a market hall" off my things-to-do before I turn 25 list. Plus, I now have a pretentious, albeit unintended, Facebook profile picture. Kudos to my lovely Ayla for the amazing photograph. 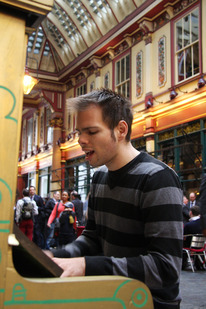 Wonderful evening at Leadenhall Market today! Special thanks to the nice lady who joined me for a song! We came from Rugby on Monday to find and play the pianos. We only heard about them at the weekend and the trip was very spur of the moment and the link on the website to maps didn't work so we only got a proper list when we got to our 8th piano (out of 9). This added to the fun as we had a great time trying to track them down and roping in workmen/city workers/tourists etc on the way. People who had been working right by pianos for ages hadn't realised they were there. It was a great day out. Pianist of local band 'Death In Texas' performs a solo set today. Video to come! 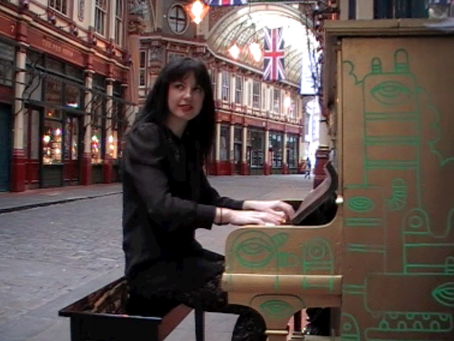 check out this video of the entertainment on show at Chop'd leadenhall today..